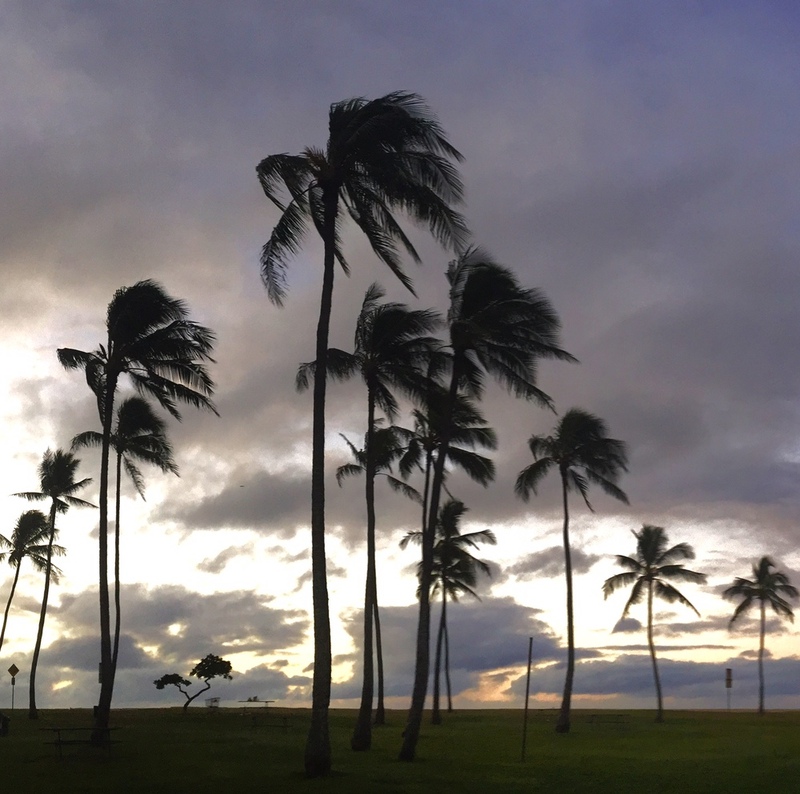 ALOHA FROM JENNIE: What was the first thing you decided to do when you woke up on New Year’s Day? When you are a senior, you don’t take special days for granted, so I bundled my pups into the car at dawn and rolled two miles down the road towards an island seashore to watch the first sunrise of 2016. As an amateur iPhone photographer, being able to share warm glowing images to the rest of the wintery world via our social media accounts is a fun pastime. Half a dozen early birds were already on the beach taking photos, and after I snapped some dazzling images and videos, I decided to pick up my little one and wade into the waves to take a video of glistening water rolling on and off the pristine sand. Well, the pup decide to wriggle hard while a wave toppled into us, and down we both went into the water. No harm done, I still had a leash on my little dog and she leaped back onto dry land in a flash, but I was left ruefully staring at a fifteen month old iPhone spiraling away into the ocean. New Year’s blessing number one, no one was hurt or traumatized in the mishap. As a cord cutter with no landline phone, you quickly realize what life off the grid without a mobile device means. You’re not going to conveniently call someone for a ride if your car keys are in the ocean (luckily not our situation). You can’t text or read/send emails. You can’t access your bank’s mobile app to see if you have extra cash for a new phone. You can’t check the cellular provider or Apple websites to see if they’re open on a holiday. You’re not going to listen to library audiobooks while you drive home. Blessing number two, you’re better able to appreciate the things you enjoy when you can’t have them for a while. Turns out that both Sprint and Apple were open on New Year’s Day, and I had excellent customer experiences with both companies, although the personality of each service rep was wildly different. Michael at Sprint looked impassive when I said my practically new phone was in the ocean and I was going through withdrawal. He stoically reviewed lease versus installment purchase plans, as I kept up a stream of wisecracks about how I had just purchased a new pair of earpods and didn’t plan to get a new phone nine months before the new models are due to arrive, while he kept up his humorless processing. Only at the transaction’s end did he express slight curiosity: So, were you like on a boat cruise or something? I said, no, I was carrying a dog, and had to make a split second decision to either hold onto the dog or the phone. He then gave an involuntary guffaw and then went back to being expressionless. At the end, he handed me the bagged phone and said, happy new year, while stifling a chuckle, so I could imagine him thinking, let's see where you go from here. Ryen at Apple processed my AppleCare insurance pro-rated refund over the phone equally efficiently, but was a barrel of laughs. He asked right up front why the phone was in the ocean, and jokingly volunteered that if he were making the same decision about his girlfriend’s chihuahua and his own phone, he would have definitely grabbed the phone. He also made logical recommendations about refund methods and insuring the new phone, and ended the call leaving me with the feeling that I had brightened up his day. Blessing number three: There are a lot of people who are good in their profession, even in the service industry where they must also contend with customers who might be irate or unable to explain their issues clearly. Kudos to Sprint and Apple for having competent and caring associates. Medical ID ‘bracelet’ on your phone – For users like me who keep their phone password locked but go on dog walks without carrying identification, the Health app has a Medical ID module that can display emergency contact info and important medical data (like allergies) on the phone’s lockscreen, accessible by emergency personnel. 3D Touch – Geez, it seems like there are multiple ways to make touchscreens respond now, including a light tap, a long touch where you just lightly keep your finger on the screen, or applying a hard depress. This will take some practice. Live Photos – Still images are still stored in the .JPEG format, but there’s also an underlying .MOV video file created in conjunction with each photo containing 1.5 seconds of video movement and audio preceding, as well as 1.5 seconds subsequent to the still photo being snapped. We’ll have to think of creative uses for this feature, and hope that Instagram/Facebook will evolve to display these results soon. Blessing number four: Technology rolls along at the speed of light, some advances are fun and useful while others are aggravating, but there is always something new to learn and apply to daily living. As we share our experiences, I am reminded that each day is what we make of it, and am resolving to do our best to be open minded and embracing during the remaining time to come. May your new year be filled with good health and aloha! 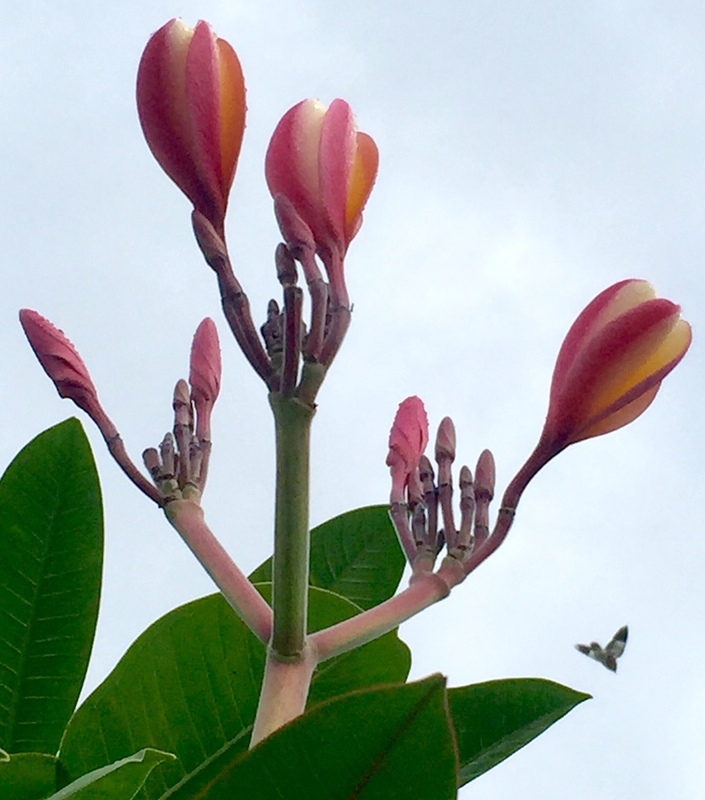 ALOHA FROM JENNIE: I debated as to whether to write this post, since it would serve no inspirational or 'feel good' purpose. In fact, it’s a bit of a train wreck, so to those of you wishing to hold onto festive thoughts and a good mood, read no further. Attempt to establish a consistent sleep cycle (around the same number of sleep hours during the same time slot each night) to achieve that optimal circadian rhythm. A short nap of less than 30 minutes in the early afternoon to make up for some lost sleep is refreshing, but don't overdo as it can worsen insomnia. Don't nap after dinner even if you're drowsy, since you might then have trouble getting to sleep at your regular bedtime. Unless you're like the dogs pictured above who love eating, playing, and watching TV in bed and then can fall fast asleep, don't use your bed for anything but restful activities so that your mind associates the bed with sleep. Use soft lights before bedtime and maintain a dark and cool bedroom with a comfortable mattress. Avoid alcohol, caffeine and large rich meals during the two hour period prior to bedtime. Smokers also may have difficulties sleeping because nicotine is a stimulant. Develop relaxation techniques prior to drifting off, such as closing your eyes and thinking of a tranquil place, take slow deep breaths, and tense your muscles tightly and then completely relax them, starting with your toes and ending with your neck. Try to avoid thinking about your stresses and anxieties at bedtime, the problems will still exist the next day and you'll tackle them better after a good night's sleep (we know, easier said than done). For some, 'white noise' from a sound machine or an air conditioner helps to turn off stimulation, while for others it might be too much of a distraction. If you've been tossing and turning for more than 15 minutes, get out of bed and do a non-stimulating activity like reading in dim light for a short period or drinking some herbal tea, and then return to bed. One of my 'happy place' thoughts is envisioning how much our pups relish sleeping, their peaceful faces full of contentment as they settle into their 'den', and that's often inspiration to try and get a good night of human sleep! If anyone has techniques that help with sleep, please pass on your tips in the Comments section. 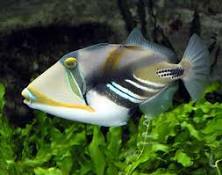 ALOHA FROM JENNIE: From Hawaiian private homes to physician waiting rooms, restaurants and hotel lobbies, saltwater aquariums ranging from micro to massive in size are incredibly beautiful and soothing. 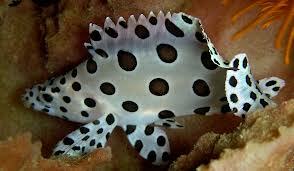 Some examples of vibrant saltwater fish that are fascinating to view in aquariums are shown above. From left to right on the top row, we are appreciating a royal gramma, bicolor blenny, picasso triggerfish and panther grouper. On the second row, we have a hawaiian wrasse cleaning a pufferfish, flame angel, hippo tang and finally, the Hawaii state fish, humuhumunukunukuāpuaʻa (reef triggerfish). 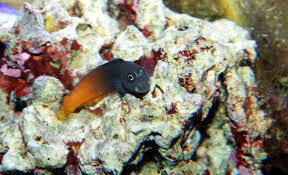 In addition to the hippo tang and clownfish made famous by the movie "Finding Nemo", Hawaii enthusiasts can also add a variety of hermit crabs, feather dusters and shrimp to round out their home aquariums. On Oahu, Hanauma Bay is the island's most popular snorkeling destination where visitors take the opportunity to see colorful fish in their natural reef habitat. 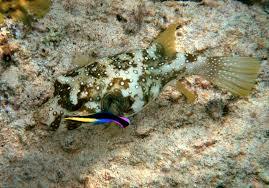 Additional aquarium photos are included in a slideshow on our IMAGES page. Seniors Love Their Dogs Even When . 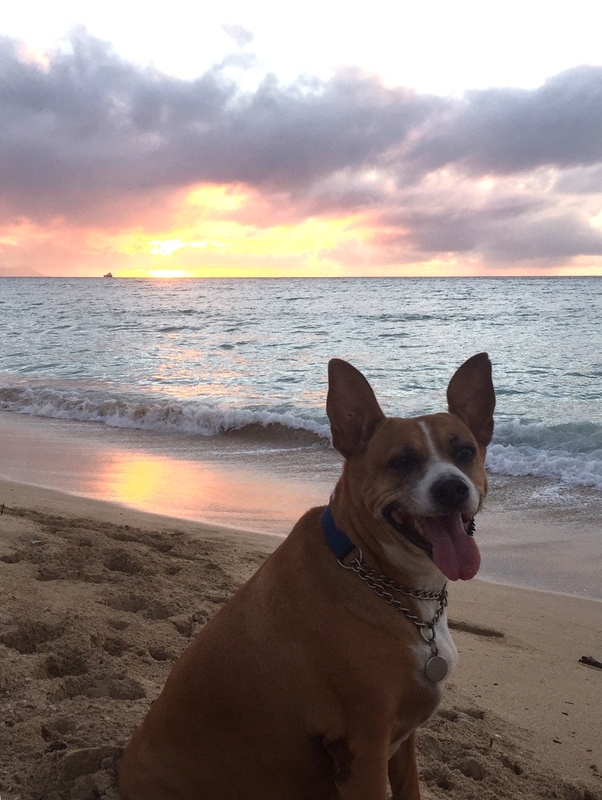 . .
ALOHA FROM JENNIE: One thing that a lot of seniors have in common is our pet companions. When I initially adopted a dog, I read up on canine care. Basics such as vet visits and grooming were self-explanatory, as were the love and bonding needs. Providing a healthy and balanced diet was a little more interesting.